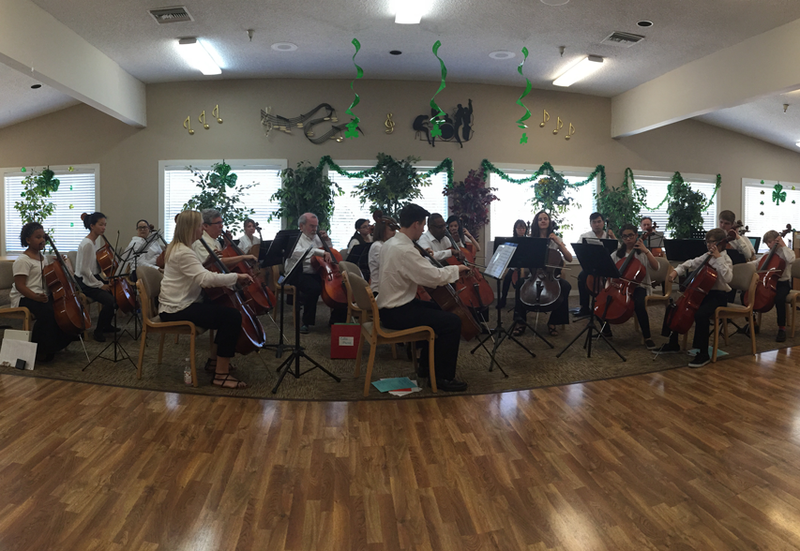 We in the Orange County Cello Choir have turned our passion for the cello into an experience to be shared with all music lovers. Our performances highlight the vast tonal range of the cello through original, multi-part arrangements of everything from classical, pop, rock, to folk dance melodies. The OC Cello Choir Live in 2015. Musicians in our ensemble reside in Orange County, California, including many of the following cities: Aliso Viejo, Anaheim, Anaheim Hills, Brea, Corona del Mar, Costa Mesa, Crystal Cove, Cypress, Dana Point, Dove Canyon, El Toro, Foothill Ranch, Fountain Valley, Garden Grove, Huntington Beach, Irvine, Ladera Ranch, Laguna Beach, Laguna Hills, Laguna Niguel, Laguna Woods, Lake Forest, Los Alamitos, Mission Viejo, Newport Beach, Newport Coast, North Tustin, Orange, Orange Park Acres, Placentia, Portola Hills, Rancho Santa Margarita, Robinson Ranch, Rossmoor, San Clemente, San Joaquin Hills, San Juan Capistrano, Santa Ana, Santiago Canyon, Seal Beach, Silverado Canyon, Sunset Beach, Surfside, Trabuco Canyon, Tustin, Villa Park, Westminster, and Yorba Linda. © 2010-2017 Carter Dewberry. All Rights Reserved.